The heirs of time they thought worth fighting for. That has so often now saved Spain. Should melt before this proud advance. We’ve not to watch but win this fight. And cost as dear before they end. Take no positions but they kill our friends. To end this war we vainly hate. And have a drink or two to celebrate. And once again time holds the mirror up. But months and maybe years of war. One nation cannot save the world for ever. 1. 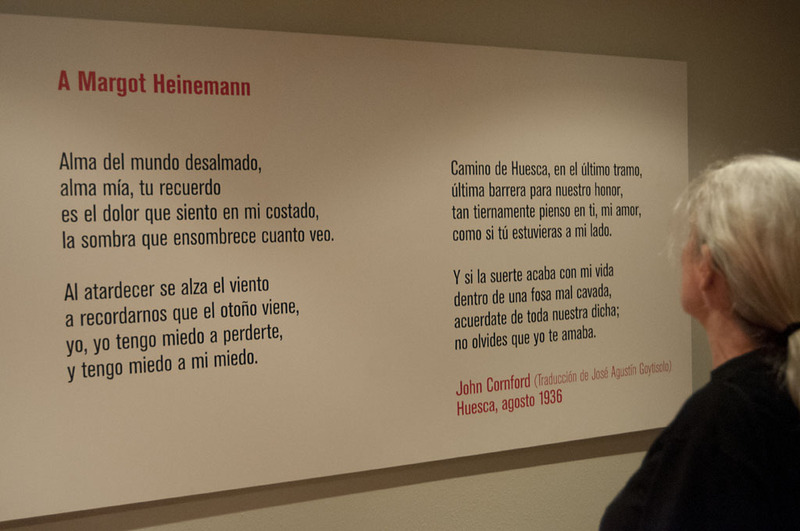 Heinemann, M., This New Offensive (Ebro, 1938), in Poems for Spain, S. Spender and J. Lehman, Editors . 1939, The Hogarth Press: London. p. 24-25. Purple, yellow and red, our banners catch the sunlight streaming through the medieval gateway. It looks like a movie about the middle-ages, not a 21st century visit to a 20th century war zone. We have reached the old town, the ghost town, of Belchite. This arched gatehouse was one of the only ways in apart from the water conduits. The outer walls of town are the windowless backs of the outermost houses. Inside there were handsome town houses, many churches, convents, monasteries and also a hospital and a social club where people could dance or watch movies. Now all are ruined. A broken jigsaw of the architecture the tourists photograph in Zaragoza or Huesca. This place looks like Gaza, Bagdad, Banja Luka. It looks like a demolition site. It smells like one too, of dirty plaster, dry rot and brick dust. I do not understand why – after nearly 80 years you would expect the dust to have settled. Our guide, a young woman, explains. She warns us to be careful, not all the buildings are safe,-it would be dangerous to go off on adventures of our own. The damage we see now- the wrecked buildings and splintered wood, does not all date from the civil war. Franco decreed that Belchite should be evacuated and a new town built, by the forced labour of Republican prisoners, down the hill where our coach is parked, where we will have lunch. The empty buildings were to remain as a terrible example of what would happen to those who defied El Caudillo.Of course not everyone was welcome in Franco’s new town. Republican sympathisers left quickly to live elsewhere. And the former inhabitants, whatever their political affiliation, stripped the buildings, taking out anything they could use in their new homes. In Franco’s time the site was preserved, after a fashion. When the Socialists were elected there was some money to maintain and repair the site. Now, the government gives nothing. The damage you see, says the guide is mostly from the weather. Some, not all. She shows us the church tower with an unexploded shell still lodged between the medieval bricks. Belchite changed hands three times the guide tells us. The first time the Republic took the town they evacuated the civilians. Our guide’s grandmother used to tell her how she had to put on all the clothes she owned to carry them with her. The International Brigaders, including volunteers from the US and Ireland, were here when the Republic took the town for the second time. Republican troops besieged the town but were only eventually able to get in after they cut off the water supply, and eventually entered the town through a dry water-course. We look across the pale rubble and imagine how long a town would survive without water in this climate. The town, the guide tells us had no particular strategic significance, but the Republic badly needed a victory after the failure to take Santander. We stop I look round the faces, of the group especially those whose relatives had served here. Manus’s father, Nancy Wallach’s father, Nancy Philipps’ uncle. They look sober. None of us talks much. 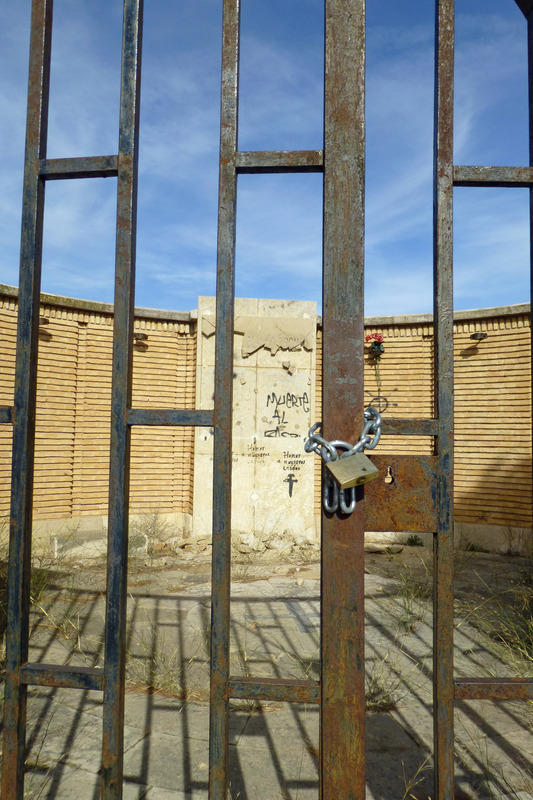 We have all read about the war, some have visited Belchite before, though not with this guide. She clearly has Republican sympathies but the stories she tells are of the horrors of war. House to house, hand to hand fighting. Killing or being killed. The guide points out a cross on the village street. A seven year old girl went out after curfew on a quiet day, believing it was safe. The republican soldier had orders to shoot anyone who moved. Her father carved the cross in the place where she died. There were too many dead fighters to dig graves for, so they took them to the old olive oil mill and buried them there. The memorial is caged and padlocked, Behind the grille you can read the contested history of this war in layers of broken stone. First the fascists put up a memorial. 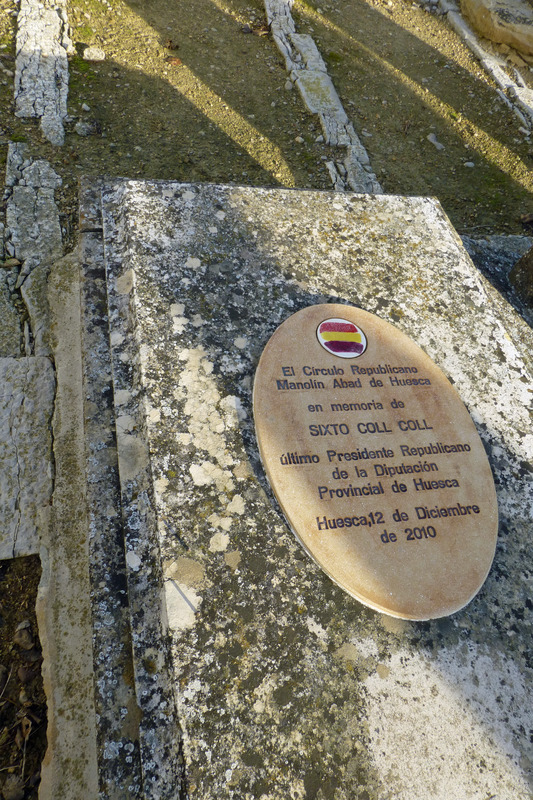 After Franco’s death the Republicans did not destroy it but put another stone in front, hiding it. Falange sympathisers came in the night and broke the Republican monument but did not remove it. There are some spray-painted graffiti. No, not all the damage here was done by the weather. It is Sunday. As we walk back through the town to our lunch people are coming out from Mass, Manus comments on our republican T shirts and banners. Nobody could be a stronger supporter of the second republic than Manus but he asks if we are being unnecessarily disrespectful. I feel a little ashamed not to have considered that myself. Later I read that the Fascists did not shoot prisoners on Sundays, just on every other day of the week. If that was their respect for religion, perhaps my scruples are a bit silly. Lunch is good but slow. I enjoy the scrambled eggs with spinach but there is no doubt that the little pink bits that speckle the green are shrimps. The vegetarians can’t eat it and an alternative has to be prepared. Then there is just one loo, which also slows us down. We are late back to the coach and our meeting with Antonio Jardiel at Quinto. We sit in the darkness of a cool public building watching film of the brigaders, like a family watching ancient home movies. “Is that your uncle?” “Oooh, look there he is, is that Bill Alexander?” Then we go out into the scorching plaza in front of the huge church to hear about the battle for Purburrel Hill and for Quinto itself. 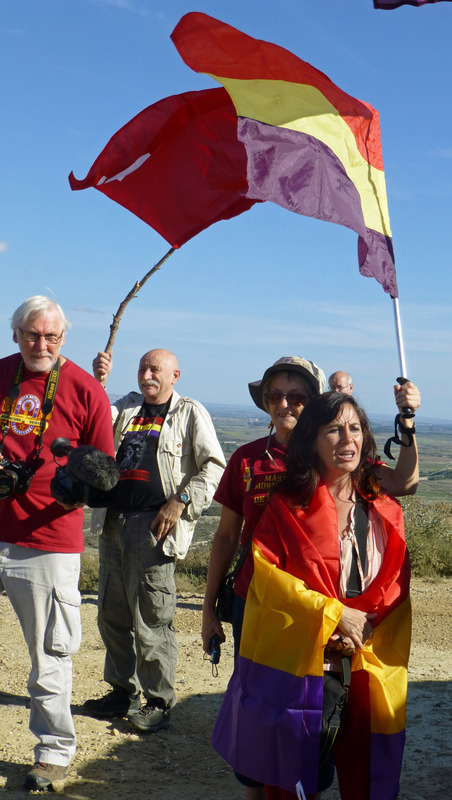 We stand in quiet groups, perhaps because it is hot, perhaps because this is a place where the International Brigades showed great heroism and also where their commander, General Walter, shot unarmed prisoners. Antonio follows the coach in his car so that he can show us Purburell Hill itself. It does not look so high. We could climb up that prickly scrub-land ourselves in an hour or two. “In battledress, with all the kit?” someone asks. ”Strafed from above?” We try to imagine ourselves scrunching down into tiny depressions in the steep scree, behind little rocks, seeking out what cover we could from the sparse spiny vegetation. The Nationalist aircraft made a mistake, they believed the Republicans had already taken the hill and bombed their own forces but the Brigaders on the hill did not know that. I am not sure if I want to hear about any more battles today. I am ready for a long cold drink and some good tapas, when we reach Caspe but everybody tells me Anna Marti is worth hearing. They are right. I need not have worried. It is a brilliant presentation. Moving, well researched, beautifully illustrated. Every map, every photograph, is easy to read and is there for a reason. The Brigades were camped over a wide area of country, groups of two or three men each bivouacked in a chabola, a shack, made of dry-stone boulders roofed with pine branches. Hy Wallach was there, Alun Menai Williams & many others. Brigade Headquarters were in some farm buildings down in the valley. Many of the men were new recruits, it was their first action. The orders came to retreat to the Ebro. Men from each chabola tried to make their way there, without maps, travelling at night to avoid bombers. They did not realise the Condor legion had out flanked them so that they were more or less surrounded. Each tiny group desperately headed in what they hoped was the right direction, shedding kit and even clothing to lighten the load they had to carry. Very few made it. What Anna has done is literally to put this journey back on the map. She pulled together all the accounts of the surviving brigaders. Local historian Vincenc Julia went to the local people with a questionnaire. “Where did you see a living brigader?” “And a dead brigader?” The two accounts tallied. Then she went across the field and the hills using the oral history to find the chabolas, entering each onto a map. The work took years. This was not for an academic degree, nor is this her paid job. We used to play a game at academic meetings, I remember, based on Olympic skating or gymnastics. So many marks for style, so many for content. Few got straight tens in both. Of course I am partisan about the content and I am not a historian, or even a proper social scientist, but this looked to me like straight tens across the board. Tomorrow we will be walking the hills with her, seeing what remains of the chabolas. I can hardly wait. This entry was posted in Visit to Aragon with International Brigades Memorial Trust and tagged Aragon, Belchite, Ebro, Hy Wallach, JD Bernal, John Cornford, Margot Heinemann, Quinto, Sam Levinger, Spanish Civil War on April 8, 2015 by adathecadre. ‘Just a brief photo-stop’ it said on the itinerary. Burial grounds are always on the edge of town, except in places like London where the buildings have overflowed to engulf the ring of grave-yards, asylums and sports grounds that were once beyond the city limits. Pere parks the coach by the gate of the cemetery, just outside Huesca. We get out and meet Victor Pardo Lancina, a local historian who is our guide for the cemetery and Estrecho Quinto. The morning is very bright, it promises to be another hot day. The wall round the cemetery is white stucco, interrupted by piers of lighter coloured brick. It looks like the wall of Chy Govenek, where I used to work, a very ordinary wall. Fermín Galán Rodríguez and Ángel García Hernández, the first Republican Martyrs, were military captains involved in a failed Republican coup on December 12th 1930. They were arrested. After a perfunctory trial they were shot on December 14th. Before his death Angel Garcia made his last confession to a priest. Fermin Galan chose not to, so he is buried out here in the municipal, not the Catholic, cemetery. They have restored his tomb. His name is lettered in gold. A faded silk rose that once was crimson sits at the foot. At the top is a bright ceramic plaque with a tiny flag in the Republican colours, red, yellow and purple. It looks new and a little garish against the weathering stone. In Franco’s time, Victor Pardo tells Almudena, Fermin Galan’s mother had a cross placed here. When the grave was refurbished Circlo Republicano took the cross away and destroyed it. Almudena, the Art Historian, flares into a burst of righteous indignation. Most of the time she is staunchly anti-clerical, but it seems she is angry about the lack of respect for his grieving mother. The destruction of an artefact, by people seeking to restore memory also disturbs her .If they did not want it here it should have been stored. But Fermin Galan chose not to be buried with the rites of the church; would he have wanted a cross? He is beyond caring, says Almu, the free-thinker, and his mother was not. I think she is right. Who owns this dead man? His family or the Republic he died trying to establish, or today’s Republicans, who he did not know and may not have agreed with? Victor draws our attention to that unremarkable wall. This was where executions took place during the Civil war. Franco’s troops would bring the prisoners here and shoot them. I suppose it was more convenient for burial. Earlier in the war an anarchist militia were encamped in the cemetery. At night they went into the Catholic part of the cemetery. They took some of the bones out of their niches so as to have somewhere to sleep. The fascist newspapers deplored the desecration of the grave yard. Bombing it however, was not in their eyes an act of desecration. A weight of horror and sadness hangs over the bright walled garden. I have only felt that heaviness once before. My friend Stuart Todd and I were at the Mandela Gate, where the ferry leaves for the Robben Island tour. There was no boat that day, the rain and wind were too bad. We walked round the little museum and watched film clips about apartheid. There was a sorrow in the air that made it difficult to move, that you could almost taste. We brought our own losses & disappointments with us that day, but it had to do with the place as well. The weather is lovely today. The shadows are crisp and the pale walls clear against a cloudless blue sky, but there is the same leaden feeling in the air. We move into the Catholic part of the cemetery, which is much bigger, as you’d expect in a Catholic country. Straight ahead is a little housing estate for dead people. Roofed buildings face one another across a narrow street. They have put silk flowers in all the front windows, white, purple, blue, green, orange, crimson. I do not find it at all creepy, though it is a bit odd to my Northern eyes. The members of one tribe are always surprised to see the exotic customs of other peoples. Round the corner we find another wall of funerary niches. One is decorated in Republican colours. We walk across open ground where there are tombs and cypresses, more like an English church-yard. Victor stops by an iron cross with a wreath faded to mauve, cream and pink in the Southern sun. There is a mass grave near this spot, he tells us. The authorities have not given permission for exhumation. People have known for many years where their relatives must be, but there is no confirmation, no memorial. And in this country, graves are important. The IBMT visit is the morning of 18th October. 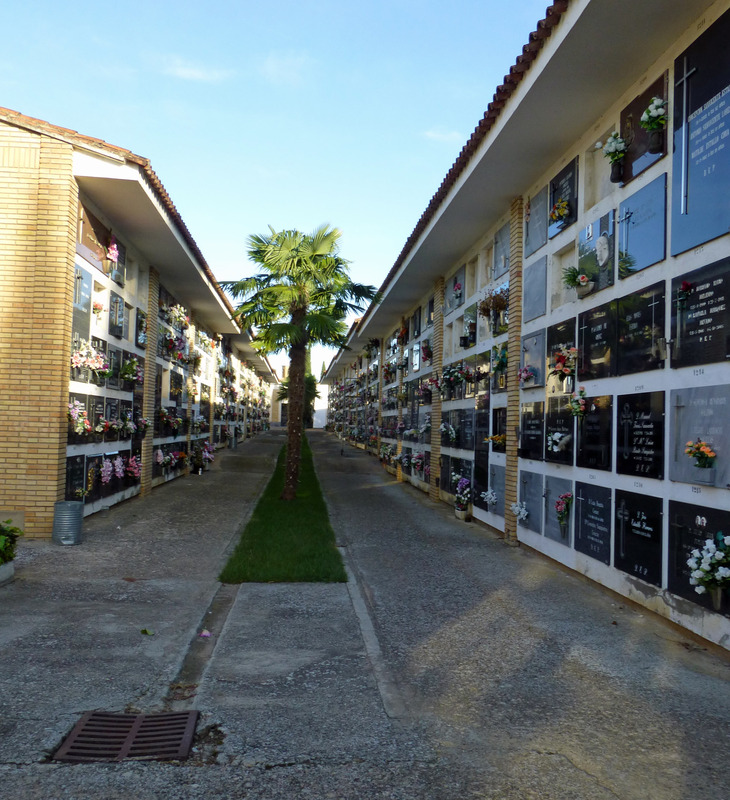 Families all over Spain will visit graves to place fresh flowers on 1st November. There will be no family visits on All Souls day for the hundreds of thousands of dead Spaniards who still lie in unmarked mass graves. I am a free-thinker like Almu, I do not believe in a spiritual afterlife. The dead live in the memories of the living, or not at all. We drive on from the graveyard to Estrecho Quinto, the trenches outside Tierz that I wrote about in my last post. After a picnic lunch in the burning heat we visit the Civil War Museum at Robres. There is a machine gun outside. It is on wooden wheels like a farm cart. Inside there is shade and it is cooler. I quietly slip my sandals off to feel the cool tiles under my feet. Almudena introduces us to the guide who seems excited that the ‘hija de Margot Heinemann’ is visiting. It is a small museum, beautifully laid out. There are a few artefacts, some rifles, hand grenades and posters, secretly stored behind pictures and under mattresses during the 40 years when to possess such things was to risk imprisonment or worse. Most of the exhibits are panels of text with terrific photographs. In 1936 it seems that every documentary photographer in the world headed for Spain. I would have been happy to wander round, painstakingly mistranslating the Spanish captions to myself but the group decides we will take the guided tour. I pause by a picture of a young woman with glasses and an extraordinary hair do. I discover that she was a woman doctor, the first in Spain and specialised in family planning. Someone calls me, I go round a corner and there it is. That poem again. Taking up the whole wall this time. ‘A Margot Heinemann’ . I read it to myself, under my breath, I know it so well in English that it is bound to improve my Spanish vocabulary. Before I can finish, everybody wants me to pose for photos in front of it. I have to keep my head low against the wall so I don’t cover up the writing. The posture and my aching feet are uncomfortable. In the pictures I am wild haired, wild-eyed and grimacing, ‘Like a head on a pike in the French Revolution’ not at all a suitable image for a respected hija. Luckily Marshall took one picture earlier; it is the only one I am prepared to show here. The main part of the exhibition shows everyday life in the republic and during the war. The day a library arrived in a small village. The secular schools where girls and boys were educated together. Propaganda photographs of cheerful militianos and militianas on the streets. Uniformed soldiers straggling untidily along dusty tracks. Women and children running. A soldier incongruously driving sheep. An old woman with a ravaged face, weeping. Lines of refugees climbing the Bolsa de Bielsa. You would not know they were 80 years old except for the vehicles. The houses, the expressions, even the clothes could be contemporary, but the trucks and cars give it away. One red wall names all those who died in this area in line after line of white print. I try to read them all, but again we have to move on to another room. That evening we carry on with our conversation about memorialisation at a question and answer session with Victor Pardo and Almudena back at the hotel in Huesca. Amnesty International estimate that only Cambodia has more unnamed 20th century dead than Spain. The historian Professor Paul Preston estimates up to 200,000 of Franco’s opponents were executed during the civil war, and as many again between 1939 and 1945 – more than all the disappeared in South America’s dirty wars of the 70s and 80s put together. It is 80 years since the coup d’état by Franco and the other Generals that started the civil war They continued to murder & oppress long after they had destroyed the Republic and its elected government. No-one has been charged for civil war and dictatorship-era crimes against humanity. There were no ‘Nuremberg’ trials in Spain, no committee of Truth and Reconciliation. I wonder what degree of reconciliation is possible without truth. Almudena and Victor remind us that Franco was not defeated, he handed over government to his chosen heir. That heir permitted elections and a Socialist government was overwhelmingly elected. Part of the deal was that there would be no prosecutions no discussions of the past. A pact of silence, of forgetting, of oblivion. All the parties of government signed up to this, including Socialists and Communists. Almudena is very bitter about this, “My generation”, she says,” say that there was no Transition but a Transaction.” She accuses the Socialists of cowardice. It seems to me that if there was a real risk of a further fascist or authoritarian coup, a degree of fear might have been justified and even responsible. It is as important to prevent more repression, imprisonment and ‘disappearance ‘as it is to remember the dead and uncover the crimes of the past. If both were possible both should have happened but were they? Even now there are progressive people in Spain who think the movement for Historical Memory is taking things too far. On my first night in Huesca I met up with my dear friend Elena from Zaragoza. I have known her since I first visited Spain in 2001. Since then she has been widowed, our children have grown up, she has advanced in her career, I have retired. In both Britain and Spain we have had to deal with right-wing governments and austerity. There was plenty to talk about, including the reasons for my visit. Elena is also a historian but her field is the history of science, she is not terribly interested in the history of the civil war. She is a Trades Unionist, a woman of the left. .She had never visited the civil war sites, and was not sure she wanted to. The dead should be named she agreed, but was there any need to take it further? This was such a contrast to Almudena’s passion for uncovering truth, no matter how painful, that I was intrigued. I enjoy being with her and with Almudena for very similar reasons, the warmth of their personalities, their, intelligence, their humour and the enthusiasm they bring to whatever they do. Why do these two wonderful women feel so differently about historical memory? After I got back from Spain I remembered that Margot could not bring herself to read books about the Nazi Holocaust. ’ I know what happened,’ she said,’ what is the point of upsetting myself? Those books are for people who do not know, or have no imagination’. She never visited Auschwitz. In 1966 she went round Buchenwald . It was just about bearable, she said, because her guide had been a prisoner there himself. On the other hand she and my father watched the BBC series on the First World War, discussing each episode. They had their own, well-polished Second World War stories too, Margot in the Blitz, Des and the Normandy landings; but torture, starvation, killing, dying, extermination and betrayal were not mentioned. The subjects were not forbidden, I think they would have answered if I had asked, but I did not. Perhaps they talked about it when I was not there. Perhaps they chose to forget what was too painful in the past so they could get on with the future. We could have done with longer for our discussion that evening but we needed to eat, drink and relax. When the small group I was with reached the hotel restaurant they refused to serve us, though some others from our party were already sitting at tables. Perhaps they really were too busy, but we wondered what they thought of our Republican T-shirts in a town where the bitterness of the civil war is still close to the surface, no less intense because it is unspoken. So a few of us; Manus O’Riordan,Nancy Wallach, Marshall Mateer, Pauline Fraser and some others went to a restaurant. The food was good, and so was the conversation, though it might have been even better if we had not been quite so tired. We were not sleeping well through the hot nights and it had been an emotionally and intellectually exhausting day. 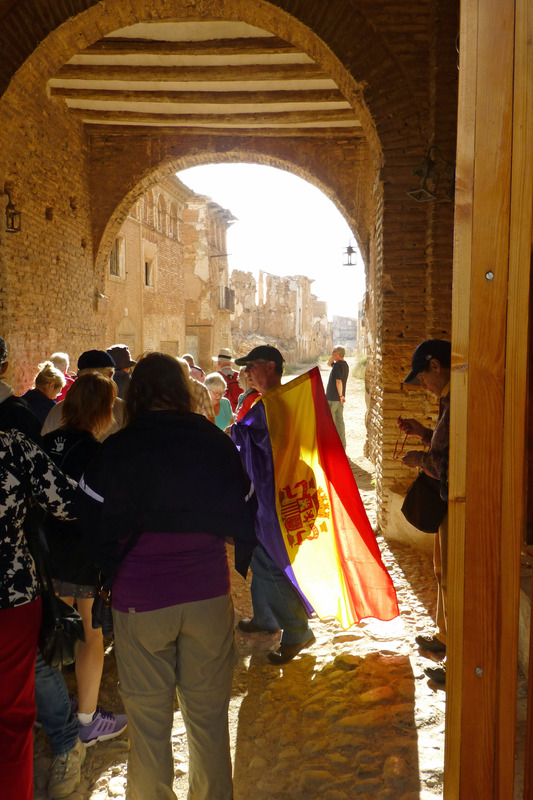 This entry was posted in Aragon Front, Memorials, Spanish Civil War, Visit to Aragon with International Brigades Memorial Trust on December 10, 2014 by adathecadre. I read aloud on the high ridge of stone, against the background he describes so clearly Heart of the heartless world, dear heart, The thought of you Is the pain at my side, The shadow that stills my view… … Then I read Full Moon at Tierz: Before the storming of Huesca It seems to me to be a useful poem for us, as we investigate the history of the International Brigades and of the Aragon Front. I know the poem well, I have thought about what each word means, why it is there, which sections are quotes from songs. I try to convey that, hoping I don’t sound like a History teacher or the celebrant at a funeral. In a way, though, that is what I am. Any one of the group could have done it, but I was asked because I am the daughter of the woman for whom they were written, the woman who , I suppose – I never asked her- made sure they were published, my mother, Margot Heinemann. Heart of the Heartless World in particular is often read at secular funerals that have nothing to do with war. Sociologists, who have a theory for everything, say that we die two deaths. Biological death is what most of us think of as death, heart stopped, movement and breathing ceased. Social death only occurs when the last person who remembers us alive has themselves died biologically. We live socially a generation or two after our biological death. It is an interesting idea, one that I found very peculiar when first I heard it. Now I find it a useful way of thinking. On our coach trip we have thirty one biologically living people and perhaps an equal number, or perhaps more, who are socially alive to us though we cannot see or touch them. Some of them are closely connected to the Spanish Civil War, others are not. They brought some of us here. The poem that is so specific to this landscape makes sense to those who mourn other losses. Victor speaks. I remember thinking that what he says is valuable and interesting, with good evidence, but I must have been so keyed up with the moment, and so relieved to have got through it creditably, that I cannot remember all the details. He describes a series of bloody battles for strategic points along the front and the attempts to take Huesca. He says that the Republicans did not shoot or bomb many people in Huesca. He pauses- but, he reminds us, they cut off the water supply. People had to drink dirty water, and died of disease. I wonder how on earth John Cornford can have thought this was a quiet front. Victor explains that Cornford, and Orwell too, passed through for a few weeks each at a time when there was little fighting. Once more he pauses. This, he says quietly, was not typical. We are gathered in a rough semi-circle where the ridge has widened into a plateau, standing with our flags for the photographs. There are several Republican flags and a POUM flag but no Communist one. Fair enough, I think, this was a POUM militia. Manus O Riordan and John invite me to stand by the Connolly column flag, and on the basis that my father, who really has nothing to do with any of this, was Irish, I am pleased to do so. I have John’s photograph with me, the one where he looks uncharacteristically like a matinee idol so I hold it up. The photograph Margot preferred shows him grinning, a smile, she said that lit up his face at the most serious moments. His hair is not only long but uncombed and could do with a wash. Alive, he was no poster boy, no matinee idol, “That handsome head charmed no acquiescence, He convinced and led.” He would not have described himself as a poet either, but as a historian, a revolutionary and, whether we like it or not, as a Communist. Manus strikes up with the Internationale and we all join in, though the Americans know different words. Then I start Bandiera Rossa and again everybody sings. We walk down a narrow path to the trenches. On one side is a dug-out room, I creep in, try to look round with the light from my mobile phone but there really isn’t time to play. We pause by a memorial to John Cornford himself. It is damaged. I am nor sure if it was vandalised, like some of the other boards we have seen on this trip, or damaged by a falling stone. Water has seeped under the broken plastic making strangely beautiful sepia and purple patterns of the writing. His photograph is still clear in the bottom right-hand corner. I put my few wilted sprigs of wild flowers there. Victor embraces me. He and I pose for a photograph. It feels right. Marshall Mateer filmed the whole tour. https://www.flickr.com/photos/ibmt/16480436801/ . Here you can see exerpts from my reading. If you want the whole poem you need to look it up. Excerpts from John Cornford’s own writings come from Understand the Weapon, Understand the Wound: selected writings of John Cornford and are also in John Cornford :Collected Writings. Both are edited by Jonathan Galassi and published by Carcanet http://www.carcanet.co.uk/cgi-bin/indexer both, sadly are out of print. John’s nephew Adam Cornford & Sandra Mendez Rosenbaum are working with Galassi and Carcanet to raise the money, through crowdfunding,for John’s writings to be reprinted. This entry was posted in Visit to Aragon with International Brigades Memorial Trust and tagged Heart of the Heartless World, John Cornford, Margot Heinemann, Tierz on November 8, 2014 by adathecadre. 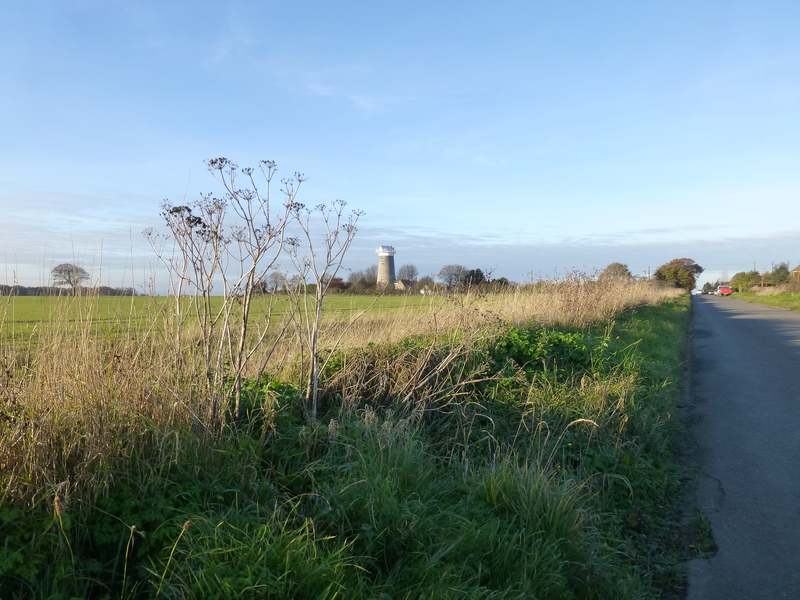 The innocence of this quiet plain…..
Our road runs across a flat, dry plain. Though it is autumn, the sun is hot and some fields shine bright green. Crops grow well here because of the sunshine and the water flowing down from the Pyrenees in the rivers and diverted into canals and aqueducts to irrigate the bone-dry soil. It is easy to see how water, or the lack of it, became a weapon in the Civil War. The flat-lands are punctuated by steep eroded hills, stony on the top, with columns of sand and gravel spilling down their sides. There is not much vegetation up there: sparse spiny aromatic scrub: broom, rosemary, gorse and other plants that I can’t name. We have arrived at Santa Quiteria to see the trenches. 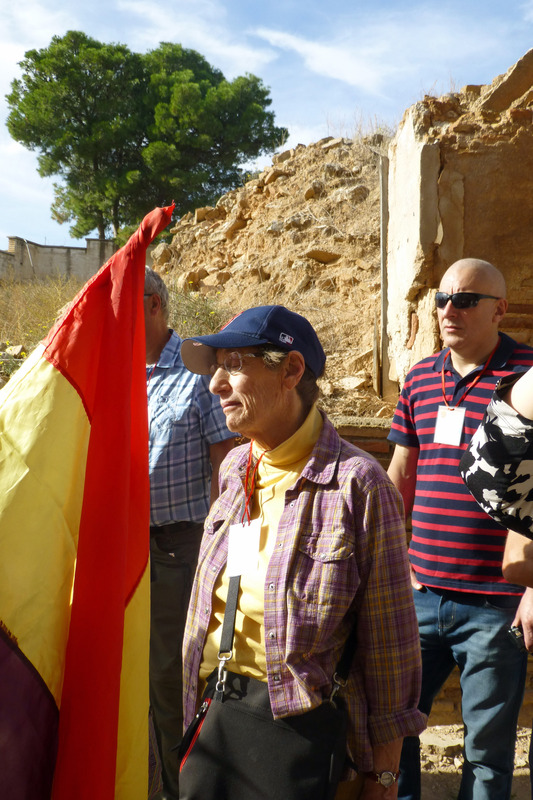 At nearby Tardienta, we picked up Almudena Cros, President of the Asociación de Amigos de las Brigadas Internacionales (AABI), who is to be our translator, tour guide and passionate advocate of the restoration of historical memory. She is an Art Historian by training and makes her living running tours of the Prado in Madrid. I would love to go on one some time. I find it easy to imagine her chivvying groups of tourists through the crowded streets. Naturally she would be waving a purple yellow and red Republican umbrella above her head. 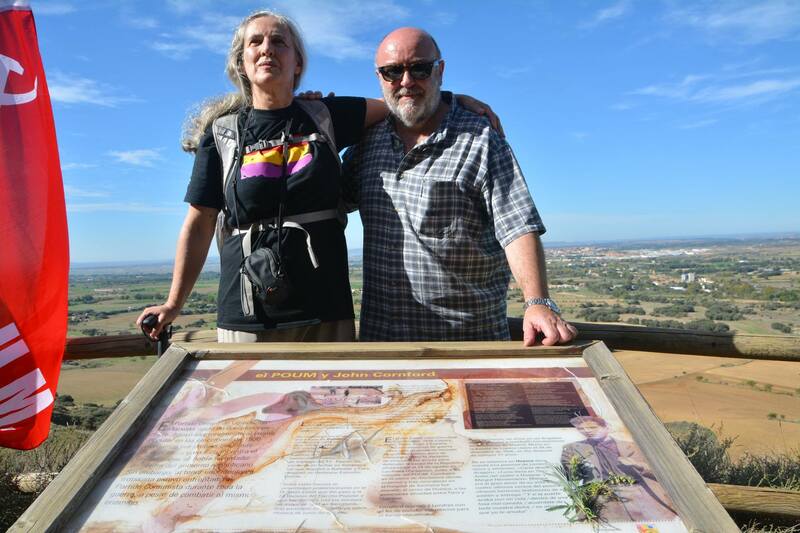 Ramon Hernando, a local Historian and the Alcadesa (Mayor) of Tardienta join us at the trenches on the hilltop. Trenches. For readers in the UK, the word evokes an image of Flanders fields: muddy ditches half filled with water and body parts, glimpsed across a foggy desert of barbed wire and broken trees. These trenches also represent the horror of war but they are nothing like those WW1 photographs, though there is some barbed wire. These are more like the walls and ditches of a hill-fort, made not in the iron age, but in 1936 when the front line ran through here. They are gouged into the solid rock round the summit of each little dry hill, commanding a terrific view of the plains below. Ramon sweeps his hand across the view to show us the front line. Behind us, towards Barcelona and the sea, Republican: looking North, the forces of Franco, supplemented by those of Hitler and Mussolini. He points out the villages on either side of the line. Here was the villagers were sympathetic to the Republic, here to the fascists. The Republic sent militias from Barcelona to reinforce the village militias. In August 1936 there were no International Brigades. The early British volunteers, like Felicia Browne, John Cornford and George Orwell, attatched themselves to one militia or another in Barcelona, and were posted to the Aragon front, each in a different unit and with no knowledge of one another. Yesterday at Segur de Calafell the members of the party gradually drifted into the hotel. We did without formal introductions but made ourselves known to one another one to one, two to two. We are a bit of an international brigade ourselves. People have come from Australia, from Puerto Rico, the Netherlands, the United States, Scotland, Northern Ireland and the Republic of Ireland. There is even a Dutchman from France, who makes wine. We are all here to honour the Brigaders. Some have a personal connection to a particular volunteer, others were brought here by a love of Spain, an interest in the art or literature of the civil war, in military history, a shared politics. The Republic plays an important part in the history & mythology of both socialist and anarchist movements in the UK. There are retired teachers, artists, a window cleaner, a social worker. Mysteriously two men seem to be in cycling gear, though they have no bikes. I feel like a bit of an impostor among the relatives of the volunteers. I am not John Cornford’s daughter. Indeed I suppose that if he had not been killed in Spain I would not exist at all, though I have admired him all my life. 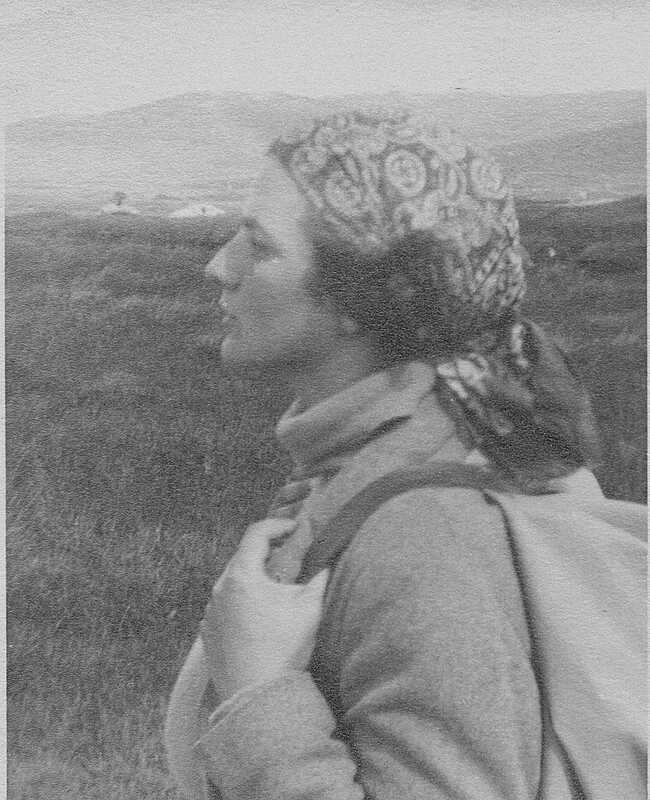 My reason for being here is my mother, Margot Heinemann, and I am writing her biography partly to show that she did something with the 78 years of her life as well as inspiring that wonderful poem. I realise that I probably know as much about John Cornford as anyone in the party but I am just beginning the research for the chapter on 1935 to 36. There is an awful lot to try to learn. One old comrade refused to be drawn when I asked if he was here to remember a particular person. He had come to pay his respects to ALL the Brigaders, he told me sternly, and he was quite right. The International Brigades themselves came from many countries to defend an elected Popular Front government that contained many political tendencies. But, at the same time, it is the individual stories, jokes, songs, poems that make the figures come alive. I do not want to invent dead celebrities, but I want to make sure the next generation has a chance to learn this history. When Peter Stansky and Billy Abrahams were writing ‘Journey to the Frontier’, their 1966 book about John Cornford and Julian Bell, they came to see Margot. She agreed to be interviewed. She gave them material. But she was not sure that the book should be written at all. Most people killed in the Spanish Civil War were Spanish, she used to remind me. There were about 2,500 British volunteers in the International Brigades, about 500 were killed, most were workers. It was not really a war of young poets exploding like bombs. Does my class make me an impostor? In that case Margot Heinemann and John Cornford are impostors too, at this gathering. Do I need to explain that I attended a state school, that I am not really posh? Suddenly I hear Margot’s voice, the ringing cut glass tones, borrowed from Noreen, that she only used when middle-class people were being pretentious, or just plain silly, “Even in my day we talked about workers by hand and brain.” Everyone here has come to remember the brigaders, or a particular brigader, that is enough. We stand in the bright sunlight, watching the flags stream above us. There is a noticeboard describing the site but it has been defaced. The graffiti have been scoured off but most of what is written is indecipherable. We listen to Amudena as she translates Ramon’s account of the bloody history of the plain below us. “This is a quiet sector of a quiet front. But the shroud was too small and his washed feet stuck out. Tomorrow we will have coffee in Huesca and then I will visit the trenches above Tierz. This entry was posted in Visit to Aragon with International Brigades Memorial Trust on October 30, 2014 by adathecadre. “La Blogga Continua” I am determined not to be defeated by either Bill Gates or my own lack of techie skills. WordPress is no longer working on the lap top. Let’s see what I can manage on the i-pad, until I can find a teen-ager to rescue me. 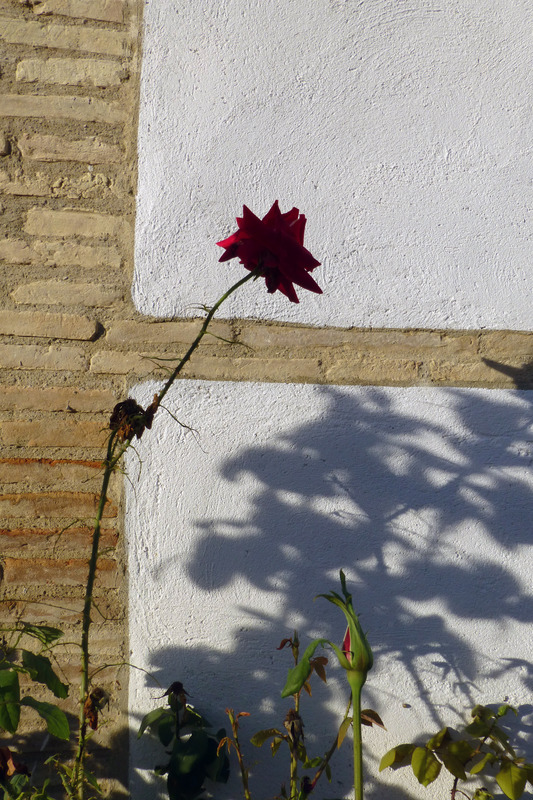 Flower shops seem few and far between in Spain. All we want is a few symbolic carnations to throw into the river but we do not find any. Felicia’s niece Glenda settles for a bouquet of berries that she picks from a tree outside the museum at Robres. I give her my hair band to hold them together. We all head for the railway bridge to see where Felicia Browne, a new member of the militia, went on 22nd August 1936 with a party of German & Italian comrades, to blow up the munitions train near Gurrea de Gallego. They were only partially sucessful, the bridge was damaged preventing Fascist re-inforcements reaching Tardienta, but they did not get the train. On the way back they ran into a fascist ambush. An Italian comrade, Paulo Comida, was wounded in the foot. Felicia went back to help him. They were both shot dead. Glenda has come all the way from Australia to visit Spain, to commemorate the aunt she only knew from vague and contradictory family stories. Yesterday she presented a copy of one of Felicia’s drawings to the Alcaldesa, the Mayor, of Tardiente. It will hang on the wall of the Town Hall, the Alcadesa, a youngish woman, told us, at least until the elections in May. Felicia’s pictures will be among those exhibited at Pallant House, near Chichester between November 2014 and February 2015. Artists paint their own memorials. The rough track above the river Soton has more wild flowers beside it than we have seen up on the hills. 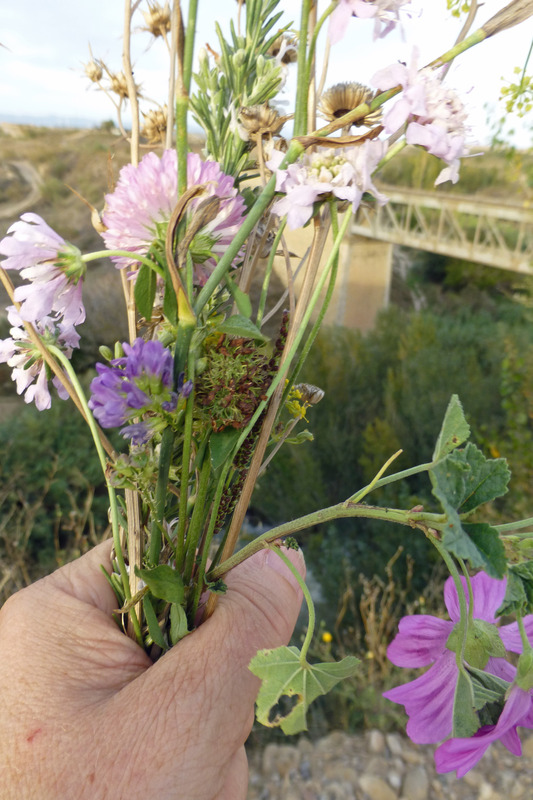 Several of us pick little bunches of track-side weeds & wild rosemary to add to the tribute. Florists’ flowers might not suit Felicia anyway. All the volunteers were unlikely warriors, but Felicia , the first British volunteer killed in Spain, was one of the most improbable; and not just because she was a woman. She was an artist, she had only the few weeks military training she got in Spain, and most astonishing to me, she grew up in Thames Ditton. Because I know Thames Ditton, a village in Surrey on London’s SW fringes. It is a nice place to go for a drink by the river on a warm summer evening, but not remotely artistic and then as now solidly upper-middle-class & Conservative. It is a village but neither agricultural or industrial. The men and younger women commute to the city. I am surprised it produced Felicia but not that she abandoned its constricting environment. She went to Art College in London . In 1933 she joined the Communist Party. The British security service opened a file on her after she fell ill and was admitted to Guys hospital. It seems that the patient was trying to convert the nurses to Communism. In the picture I have seen she has short hair, cut in a fringe, thick spectacles and a cheeky grin. She looks a bit like Harry Potter. We come to the railway bridge. Glenda and one or two others scrample down to the disused line but it is clear that it would not be safe for the whole party. The Soton is quite a big river, running fast with cloudy green water that looks like glacier melt. Flags wave for photographs. They climb up to the cart-track. Where it crosses the river there is another bridge. We stop, raise our flags. Glenda and Pauline tell us about Felicia, then Glenda raises her arm to toss the improvised bouquet into the river. We run like children to the other side of the bridge to see it emerge but it has disappeared entirely, swallowed up in the milky green water or caught on a barrier under the bridge. This entry was posted in Visit to Aragon with International Brigades Memorial Trust and tagged Artist, Felicia Browne on October 29, 2014 by adathecadre. “Ay Manuela, Ay Manuela,” they chanted. Hy Wallach was horrified. He had just arrived in Spain from New York to join the Abraham Lincoln Brigade. As instructed he had told nobody at home where he was going. Now he heard a crowd of strangers calling out what sounded like his name. Were his family searching for him already? It was not until later he realised that it was a song and nothing to do with him. He used to tell the story as a joke against himself. He talked a lot about Spain but when he talked about his own emotions he usually made it into a funny story. His daughter Nancy and I are walking along the edge of the Mediterranean at Segur de Calafell. The water is warm but there is quite a sea running, sometimes my trousers are splashed and I have to step back. Nancy was the first person I met from our party. She is very senior in the Abraham Lincoln Memorial Association. We get on at once, laughing as we recognise our common culture, though her family came to New York from a shtetl and my mother’s from the highly assimilated Jewish community in Frankfurt. It seems that there are certain ways of being a left wing secular Jewish family and that ours adopted similar styles. She asks if I remember that scene in Annie Hall where he contrast the two families, one shouting and interrupting all the time, the other polite and dour. By this time she and I are talking through one another like long lost cousins, raising our voices, waving our arms. She tells me I look like her friend, Helen; she reminds me of the best people I grew up with. . She tells me about the arts focussed primary school where she used to work, it sounds terrific. These days she is a fine artist, working in batik. Her father was captured in the Battle of the Ebro and sent to the notorious San Pedro prison. I ask if she knew about Clive Branson, who was there as well. My mother’s best friend was his wife, Noreen. We talk about how they survived, mentally as well as physically, in that prison, or should it be called a concentration camp? They were kept alive for exchange with Italian prisoners, but the US prisoners did not know how long they would have to wait. Hy became a gambling man. He hoped it would increase morale. He predicted that someone would be released on a particular day. They had little money, few possessions, but the stakes were high. If he guessed wrong, he promised to push a coin across the floor of the filthy latrine – with his nose. The day was drawing to a close and he was getting ready to pay up, when at the last minute, the orders came for the man to be released. The prisoners ran an underground newspaper there. They even had the University of San Pedro she says. “Of course,” she says “it was all led by Communists.” “Of course,” I agree. We establish that both our parents were in the Party. “Red nappy baby.” I say. She immediately comes back with “Red diaper”, the US equivalent. Other prisoners have educated one another in captivity. On Robben Island tour guides point out the quarry where the men studied for their O’ Levels when the guards weren’t watching. I also think about Midge Gillies book about British POWs in the Second World War that she called ” Barbed Wire University”. We wondered if it just happen spontaneously in each place, and how the later groups might have learned about the earlier ones. We talk about Clive’s paintings and his daughter’s. One of Clive’s hung on the sitting room wall in the house I grew up in. Nancy has seen them at the Tate. I describe some of Rosa’s pictures and her earlier embroideries. There was a fabric collage of enormous red and orange birds. I have not seen or thought about them for thirty years but I remember them clearly, or think I do. It feels as though Nancy and I have friends in common, though Clive died before she or I were born. Neither of us believes in a supernatural after-life. The secular atheist ghosts of her father, my mother and Noreen walk comfortably with us along the sea-shore. This entry was posted in Visit to Aragon with International Brigades Memorial Trust on October 23, 2014 by adathecadre. Sorrow’s but a ravelled thread to draw back our active dead. 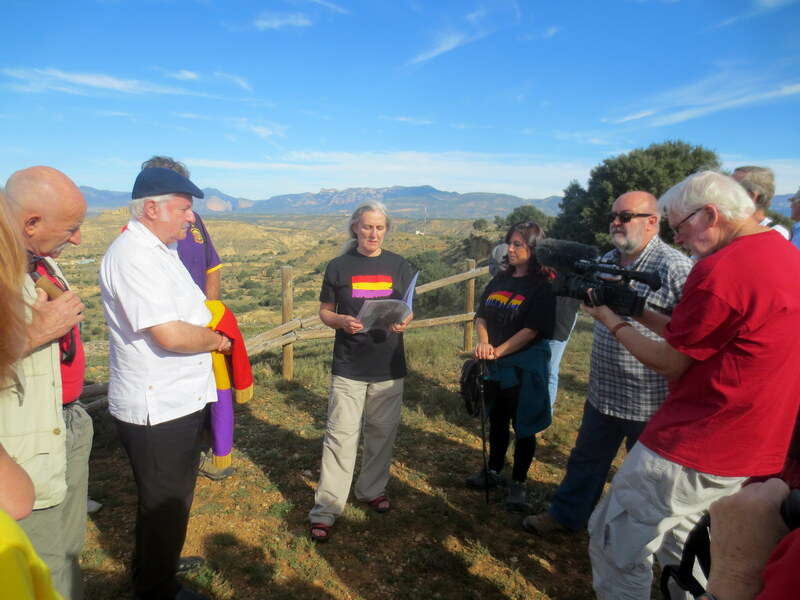 This blog is about my visit to Aragon with the International Brigades Memorial Trust. 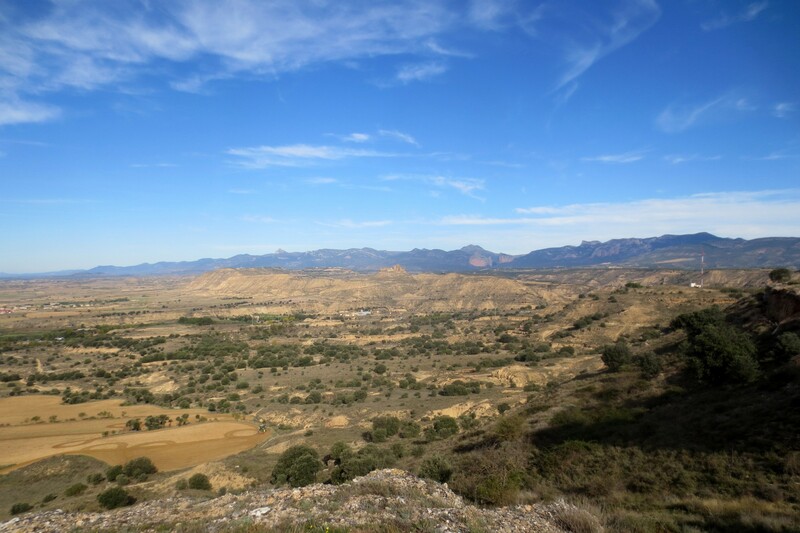 We will be visiting the towns, trenches and mountain-sides that were the Aragon Front in the Spanish Civil War. In Spain memories are still contested. When Franco was alive, memorials to the Republican dead were forbidden. Then came the era of “Don’t mention the war”, the Pacto de Silencio. And now though memorials can be erected, they are often vandalised in the night so that it is safer to have them inside buildings. I am Jane Bernal and I am working on a biography of my mother Margot Heinemann. I’m visiting Aragon to see where her lover, fiancé, companero, John Cornford fought when he was first in Spain in September 1936. Writing this blog allows me to practice writing, to try out different ideas, even it does make me sound like Dodie Smith at the beginning of I Capture the Castle. Margot only visited Spain herself after Franco had gone. The Spain she wrote about was a place she had never seen. She wrote about it, on and off, all her life. We found this poem among her papers when she died in 1992. She must have written it in the last two years of her life. The actor Tilda Swinton read it at her funeral. Ringstead Mill is a house that belonged to the Cornford family where Margot, John and some other friends had a holiday over Christmas 1935. Do not haunt this house. Such as smiled on us. Coal-black hair and sleeves too short. Take your name and face. And the milk is spilt. Still is what you said. How can matter think again? Torn from time are lost. And the fronts they held. Who have changed the world. As a family we did not do graves much. If people remember us, we said, it should be for our work, our actions, or not at all. 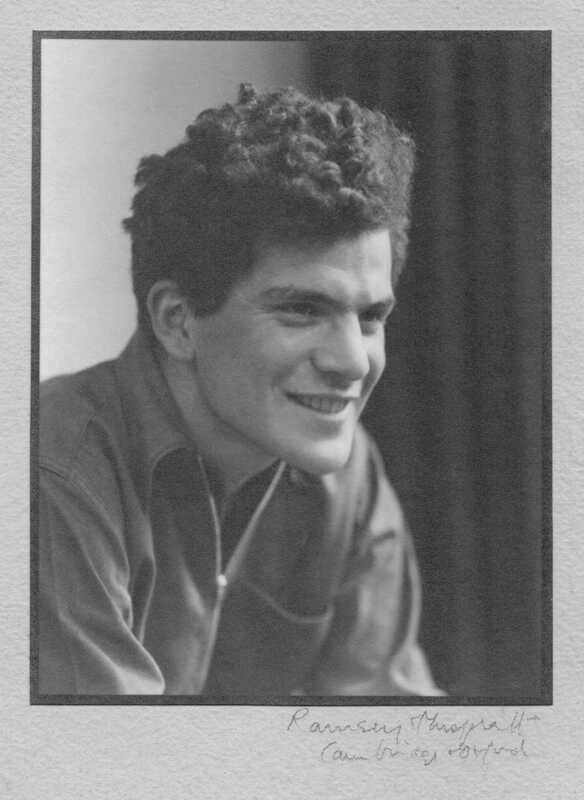 For me John Cornford is what he wrote, what Margot & other people told me about him, not whatever remains of his body. It is having the small bones of my hands crushed together by old men who tell me, in voices choked with emotion, that I am beautiful but I will never be as beautiful as my mother. She would often be in the room at the time, when we got home we would laugh about it. We both knew that most of the alleged beauty was because of what we represented, not what we looked like. Finding the actual body never seemed important. With a bullet in the brain, how can matter think again? I have never seen my father’s grave, though it is in Morden, near where I once worked. My cousin and I scattered my mother’s ashes from the summit of Stac Pollaidh. Change is their memorial who have changed the world. In spite, or because of this, death & dying, commemoration & memorialisation, interest me quite apart from this biography. When I am not being a biographer, I do research into death & dying as they affect people with intellectual disabilities. Loss can be acknowledged or hidden, disenfranchised. Are parents allowed to mourn the death of a disabled daughter or son? Shouldn’t they celebrate a merciful release? How do you mourn a Communist child or parent in a time of fascism? The Spanish victims of Franco, were, to use the jargon, offending deaths and disenfranchised losses. Now they are being exhumed from their unmarked mass graves and re-remembered. If finding John Cornford helps living people in Spain now commemorate their dead, because he was British, the grandson of Charles Darwin, a celebrity so that it increases the pressure on the Spanish Government, I suppose it is the right thing to do. I wonder what he would have wanted, or Margot, but there is no accurate way of predicting what dead people want. This entry was posted in Visit to Aragon with International Brigades Memorial Trust on October 14, 2014 by adathecadre.